Hello, everyone — it is an honor to be here at St. Peter’s Episcopal Church on my favorite holiday of the year, Martin Luther King, Jr. Day. I’m happy that MLK day is the first holiday of the year, because you start the New Year with all these personal New Year’s resolutions, and you say, “I’m going to cut back on the sweets”, “I’m going to make time to go running everyday” and then right about around this weekend, two weeks into the year, you’ve given up on all them… and you’re feeling down and don’t know what to do. And then Martin Luther King, Jr. Day comes along and reminds you that you can start your New Year off with not just personal resolutions but community and citizen resolutions — like “I’m going to cut back on my pre-judgment of others” ,“I’m going to make time to go help out and speak out and act out more around school or church or my local community every day” — and those are resolutions that are harder in practice, but easier to fight for, because you’re not just fighting for yourself. But I’m getting ahead of myself — my name is Pete Davis and I am a student down the road at Harvard, and I am here today because I had the great pleasure of being part of a recreation of an important Civil Rights project when this past summer I rode with 39 other students, a team of PBS cameras and a handful of Civil Rights Movement heroes in a recreation of the 1961 Freedom Ride. And I’d like to take part of my time here to look backward and tell a brief, yet harrowing, story about what one Civil Rights project accomplished in the 1960s, and then take the other part of my time here to look forward and share what one young, wide-eyed college kid from a small town in Virginia thinks about what we might just be able to accomplish in the 2010s. In 1961, a group of young people led by Congress of Racial Equality Director James Farmer wanted to test if a Supreme Court decision integrating interstate bus travel was being implemented on the ground. So, 13 riders — six white, seven black, including one future Congressman John Lewis — set out on Greyhound and Trailways buses down South. When they got to Atlanta, they had a brief reception hosted by the big man, Dr. Martin Luther King, Jr. himself. They wanted him to come on the ride as well, but he pulled a few of their leaders aside and said, “I’m not going to get on the buses with you, and if I were you, I probably wouldn’t go into Alabama…The Alabama Klan is preparing quite a welcome.” And, like good young people, they didn’t listen to him and kept going on to Alabama. And like wise, older people, King was right. The riders were met with Klan violence, they were firebombed and some were even beaten with lead pipes. But they made it all the way down to Birmingham, Alabama. The Kennedy administration got word of this, and Bobby Kennedy called for a “cooling down” period after this first round of Freedom Riders got home. But, a young woman from Nashville by the name of Diane Nash would have none of it, and she organized a set of Tennessee students to leave school – during their final exams – and become a new set of riders to bus down to Birmingham. One night, after brutal beatings in Montgomery, these new Freedom Riders packed into Reverend Ralph Abernathy’s First Baptist Church and heard James Farmer, the great Fred Shuttlesworth (who passed away last year), and Dr. King, give rousing speeches as a mob gathered outside and threatened to attack the attendees. Dr. King had to get on the phone with the Kennedy administration to get the National Guard there for protection. 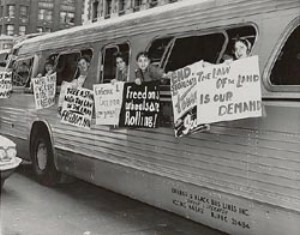 These Freedom Riders were creating quite the ruckus. They boarded a bus to Jackson, Mississippi and were promptly arrested and sent to the infamous Parchman Prison. The Mississippi Governor thought he had squashed ‘em — they’re now just stuck in Parchman Prison…what are they gonna do? Well, as one historian put it, they responded, “Fine, we’ll go to Parchman, and we’ll fill Parchman up, and we’ll have Parchman be the next site of the Civil Rights Movement.” And it became so. Hundreds of people across the country boarded buses, and headed to Jackson. They filled up the prison, and kept their morale by singing to their jailers, “Buses are a comin’ oh yeah, Buses are a comin’ oh yeah, Better get you ready oh yeah.” They took 300 riders of different races, religions, different regions, different political philosophies…and turned Parchman into a University of Non-Violence…a place to become more committed, more tough…and as one guy put it, to become “the shock-troops of the movement.” On September 22, the Interstate Commerce Commission issued its order: the “whites only” signs came down at bus and rail stations across the South. Two years later, President Kennedy — who had wanted to ignore civil rights and focus on foreign policy for his Presidency, who only had to start paying attention because, “those darn agitators” (as the Riders were called), had caused a ruckus — gave a speech in June 1963, calling on Congress to pass legislation to end Jim Crow altogether. The Freedom Riders — after arrests, beatings, and warnings to slow down by not only the Administration but also Civil Rights Movement leaders, themselves — had won. And it was 50 years later that I and other college students had the great blessing of recreating the ride on our own bus…except, in this time around, the bus had Wi-fi and air conditioning; and lacked the threat of arrests and Klan mobs, fortunately. And I want to spend the rest of my time here talking about what I learned from this experience — one that involved seeing former Jim Crow cities up close and personal, talking with Civil Rights leaders new and old, and, most importantly, getting to know 39 diverse student activists from all across the country. And I know what you’re expecting: a heartwarming tale from me about how we students — black, white, and brown, 50 years later — held hands in a big circle, sang “We Shall Overcome,” and declared racism over. Though we did hold hands at times, and though we did sing We Shall Overcome so many times that I was considering singing We Shall Overcome-the-singing-of-We Shall Overcome… that’s not the tale I’m going to tell here today. Because we all know that resting too long on our laurels of the victories of yesterday is a recipe for not opening up our eyes to the injustices of today. So, instead here’s Three Lessons from the ride with our sight set on tomorrow. The first thing I learned on our Ride was that most people in the Civil Rights Movement did not have Civil Rights as their number one cause. Everyone, from Jim Zwerg — a white man who was beaten with a lead pipe in Alabama — to Diane Nash — the lead organizer of the second round of the rides — had an underlying loyalty that was the foundation of all their actions in their surface level causes: a loyalty to Non-Violence. When Zwerg and Nash spoke to us, they hardly focused on racial discrimination — they wanted to spend their time sharing with us their philosophy and lifestyle of non-violence. They did not see non-violence or agapic energy as a ‘lovey-dovey’ ‘give peace a chance, man’ concept. They would not have liked to be known just as pacifists… they were activists! They would not have described themselves as having no weapons or as not waging war. They saw non-violence as a powerful, strong strategy, a weapon…the only weapon they had in this fight…and an energy that was not born out of thin air…it was based on a serious theory of how to win conflicts, and solve problems for justice… a philosophy that was put best when Dr. King explained that: “Darkness cannot drive out darkness: only light can do that. Hate cannot drive out hate: only love can do that.” And, indeed, they couldn’t have won if it was a violent conflict — they were churchmen and women up against the state police and governments in the South, with their batons, and guns, and in the case of Sheriff Bull Connor in Alabama, tanks. But what they could do, is contrast their “dignified, disciplined, non-violent actions” against the other side’s grotesque reaction of violence, leaving no way — for the millions who would watch on TV — to confuse their confrontations. And when they learned that philosophy — in long training sessions for the Riders, where they practiced being beaten and not responding — and when they committed to it, when they put in the hard work and discipline to live by its principles… it worked. Out of that foundation, came more surface level tactics. Out of those tactics came victories. And if we want to learn from the Civil Rights movement to repeat their success today…if we only looked at those tactics, we might never understand what made the Civil Rights movement so successful — we have to look at their deep commitment and loyalty to foundational principles about how justice is won in history. And that’s the lesson for today’s justice movements: If we don’t have an equally strong commitment to foundational principles in our movements — if we believe we’re only fighting for environmental reform or gay rights or urban renewal… only our specific issues and not, also…, always…, at the same time… re-affirming our commitment to agapic love, to our civic connection our fellow community members — …then we are … like a sail without a mast… just flapping around in the wind…not harnessing energy to move society in any direction. So, given that lesson…why don’t we just do what they did? Why don’t we just believe in non-violence and use their tactics…get on buses, start marching, provoke some confrontations with the police? Well, people have tried that. People have taken to the streets, people have had millions at marches in my lifetime. People have occupied public spaces and provoked the police. And yet, we have not had as big a victory for justice in my lifetime as King did in his. And I think that’s because, as I learned in the second big lesson on my trip — a lesson that came to me as I saw the contrast between how the elders on the trip talked about the problems of their day and the students on the trip talked about the problems of ours — the second big lesson is that the problems of today are taking different forms than they did back in the 60’s! Back then, we had Jim Crow, explicit racism and segregation by the government. Today, segregation is not by law, but by structural circumstance, as segregation plagues not our drinking fountains nor our diners, but becomes a good way to describe how our justice system and our prisons work, when 1 in 3 black men will go be imprisoned at some point in their life. Back then, explicit racial discrimination in employment was commonplace throughout the South. Today, there’s a whole division of the Justice Department to challenge explicit racism on the job, but, today, black unemployment still stands at more than twice the rate of white unemployment, with almost 1 in 5 black men in June 2011 being without work. Racism burbles up inside of us in unexpected places, as our focus on overcoming racism here at home might sometimes forget that it is also racist to believe that a human life is less worthwhile, more disposable — more collateral and incidental and less sacred — if it’s an Afghani or Pakistani life or an indigenous person’s life. We have struck a strong blow to the type of racism that allows leaders to make slurs publicly without recourse or state legislatures to write the word “colored” into legislation. But the problems of racial disparity remain, in new forms… that can’t be overcome with the stroke of President’s pen. And the same is true for Materialism. In King’s time, the environmental movement was just in its infancy, and the concept of widespread corporate watchdogging was just an idea in Ralph Nader’s head. And today, we do see blowback against the incessant pursuit of material things, as community gardens, farmer’s markets, car sharing, slow food movements, and lifestyles around living on less are cropping up, reminding us that there still is a live belief that people are more important than, as Dr. King put it, “machines and computers, profit motives and property rights.” But, today we face unending advertising on half a dozen types of screens telling us that all our problems will be solved, all our insecurities will be vanquished, and all our deepest wants will be realized…if only we buy one more thing, use one more service. 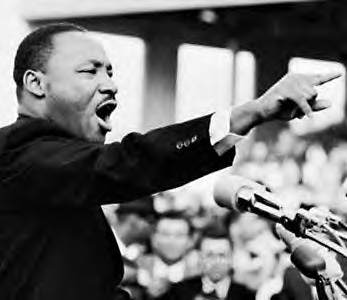 Today, our activists that are fighting to move our nation from, as Dr. King called them to do, a “thing-oriented society to a person-oriented society” are facing a steeper climb, as the monied interests grip ever tighter on the neck of our democratic institutions. And the same is true for Militarism. In King’s time, we had tens of thousands of American men and Vietnamese men, women and children killed in a grueling war. Today, we face no draft, and less civilian casualties in our militaristic pursuits overseas. But, today, we have even more trouble breaking the cycle of — what King called — the “madness of militarism” and the “self-defeating effects of physical violence” when wars are felt less back home, because the fighters are drones or soldiers from an economic bracket we never interact with. Whereas Jim Crow and Vietnam was a tumor on a part of society, many of the problems of today are more like sicknesses in the bloodstream, unable to be pinpointed. There used to be a Civil Rights song, “O Freedom”, where you’d sing about the specific thing you wanted to overcome… No Segregation, No Segregation, No Segregation over me…or No Bull Connor, No Bull Connor over me. But with problems as complex as today, what can we sing about in our O Freedoms? No more prison-industrial complex, no more prison-industrial complex over me…no more global warming caused by various forms of carbon emissions, no more global warming caused by various forms of carbon emission over me…no more deregulation of the financial industry…over me…you get the point. In the age of 24 hours news blaring and blog posts and tweets and status updates whizzing around our heads…it gets confusing even knowing what’s happening and feels with these multiple storylines going at once. Our time feels new and it feels dreadfully old. It feels like networked freedom and it feels like the old power structure is still in charge. It feels like a black president but more black people in poverty. It feels like a shiny new iPhone and a hollowed out Detroit. It feels like we don’t know what the problem is and we all know what the problem is. It feels like the solutions were made 15 years ago and are waiting to be implemented and like they’re just 15 years into the future out of our reach. Whereas our heroes knew their adversaries, ours aren’t in a single form. Whereas our heroes fought clearer, visual problems, ours are invisible and baked into institutions all around us. Whereas they had a sense of what solutions looked like, we have trouble having a clue. In the confusion about the content of the solutions, we latch onto forms of the past – we think to be an activist means to be a marcher, a rallier, a person that needs to use dramatic, direct action. But what works for civil rights, for women’s rights, for getting troops pulled out of Vietnam is not necessarily going to work to solve global warming, to fix our food system, to raise our neighborhoods out of poverty, or to invigorate our public schools. What do we act against? So what do we do? How do we keep The Freedom Riders and Dr. King’s dream alive? How do we take our agapic love and translate it into action in a world with new, confounding problems? Well, I learned on the ride that we have a choice. Option 1: Give up. Escape from the confusion of our era into safe places. Some have made that choice: those who choose to be cynical, those who use irony to distance themselves from any conviction, who laugh at those who care too much; those who complain and yearn for nonexistent pasts when ‘everything was better’, who simplify and blame it all on the other; those who keep the wheels turning on the structures that have left us all so distraught so as to see what they can privately squeeze out of it; who ignore the great public problems of our time and reject the great life in favor of the big life; and those who throw up their hands, screaming “There’s no such thing as truth and we don’t now to do…so let’s just watch some cat videos.” There’s a lifetime supply online…that’s a live option. But, we don’t want to give up. So there’s Option 2: Hope someone else takes on the great problems of our time and solves them for us. There is a certain quality to us that makes it easier for us to propose problems than to propose solutions. We all get riled up pointin’ to why this is bad, and that’s messed up, and that over there is being done totally backwards…and then we yell it out and hope someone else out there hears us and does something about it. And my generation is particularly plagued by this quality, and the last few years for many young people, has been a great example of this option. In the Presidential Election in 2008, we young people had finally thought we had found someone who was going to solve all of the public problems we had been worried about throughout our lives. On election night in 2008 — when millions of young people around the country were cheering, singing and rallying together — I had thought that we were celebrating the first shot of a revitalized movement…. a launch party of sorts for the years of collective problem solving work we had in store for us. Barack was kicking down the door to a new era and we — the people! — were going to storm in! However, after Inauguration Day 2009, the surge of youth engagement receded. The entire Obama youth movement packed up and went home, believing their work to be done, their mission accomplished. Instead of continuing to actively organize for change, we simply waited, expecting the Presidency that we had brought to the White House to solve everything for us. When it did not work out exactly as planned, the cynicism re-emerged as we were left wondering how we, yet again, found ourselves with most of the same ol’ problems that we had before. And there lies the problem with Option 2. History — and especially American Civil Rights history — teaches that we should not be surprised at all. Of course it is not the leaders we elect who bring major change to government policy. It is social movements and citizen projects from outside of government that force those leaders to act. Lincoln penned the Emancipation Proclamation, but abolitionists provided the link. FDR signed off on the New Deal, but for the workers’ movement, it was old news. Maybe Nixon proposed the Environmental Protection Agency ‘cuz he was tree hugger at heart… or maybe he faced the biggest environmental movement in history! The Freedom Riders of 1961 understood that extraordinary ordinary citizens had to hold leaders’ feet to the fire if they wanted to spur those leaders to action. When the Kennedy Administration was asking for a ‘cooling off period’ from direct action by civil rights advocates, activists kept the Rides going, understanding that it was exactly direct citizen action in times of administration uneasiness that could lead to major societal change. Their success in convincing the Kennedy Administration to support bus de-segregation proved their belief true. 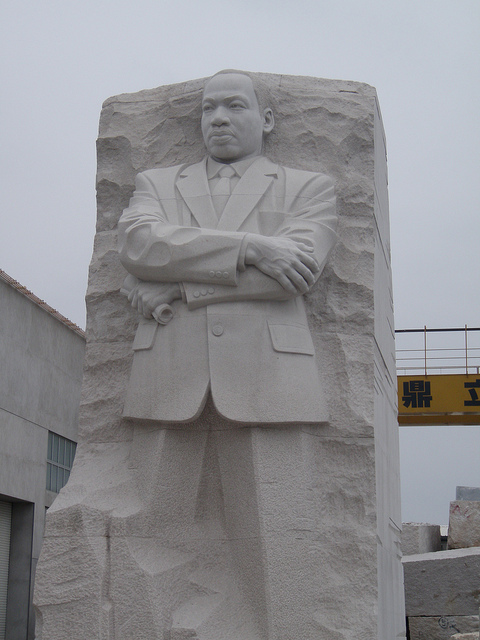 The Martin Luther King Jr. Memorial in D.C. is the only memorial that features a statute that is not free standing…rather, Dr. King’s towering figure is emerging out of a large stone of hope. It’s quite appropriate, because even Dr. King is not the be-all-end-all of the Civil Rights movement…his work and leadership only could emerge out of the tireless efforts of the tens of thousands that made up the movement. And that was the final lesson of my trip – that the real movers of American government and society are not the leaders, but rather the groups of unelected, extraordinary ordinary people who decide to commit to public action. But there still remains the question of “What is to be done?” now…well, there’s a final option: get to work, continue the struggle, know that if we collaborate and focus and work hard, we can figure out what’s going on, identify and articulate problems, and imagine, experiment with and implement solutions. Back in Dr. King’s day, in the post-World War II era, America was prosperous, and Dr. King’s battle was to include a group of people in that prosperity. He literally spoke in the I Have a Dream speech about a promissory note to African Americans that wasn’t cashed, despite the fact that the “great vaults of opportunity” of the nation had enough funds to cash it. When Civil Rights activists sat in at the lunch counters, they were sincere about it – they really wanted to eat at those lunch counters. It was a great house his generation inherited, and he was fighting to have equal access to all its floors and rooms. But, today, America isn’t doing so well. The vaults of opportunity are defaulting on their loans. Most families are having a harder time finding the excess income to eat out at a lunch counter. The house my generation inherits has some pipes leaking and broken windows and failed expansion projects. But the reason I say this is because, with the house in shambles, with the house due in for some remodeling…we have a shot. Every crisis comes with an opportunity. And America is going to be rebuilt, I’m confident of that. The question is, rebuilt by whom, and rebuilt in what spirit? There are people out there, like you in the crowd, who understand Dr. King’s dream, who know agapic love, who can imagine what a world with less racism, militarism and materialism might look like. If people like you are not in on the remodeling of America, our nation is at risk of being rebuilt with the same ol’ built-in problems, the same ol’ built-in injustices. But, if people like you participate in this rebuilding of America, out of the Great Recession of the 2000s, and into the Great Revival of the 2010s – if people like you who understand the Dream put in the hard work to participate vigorously in your neighborhood and churches and schools and campuses and elections and communities small and big…if you craft solutions that make our problems that much more meliorated… if you bend the blueprints a bit more towards justice…if you put in the focus and hard work that is necessary to make anything that matters shake and move…then the dream lives to see another day. But only if you choose to participate. Political scientists Mo Fiorina (Stanford) and Sam Abrams (Sarah Lawrence College) have done work analyzing and ultimately critiquing Bill Bishop and Robert Cushing’s popular Big Sort. Synopsis of Big Sort: Bill Bishop claims that we are increasingly self-sorting ourselves into neighborhoods politically and only associating with like-minded political neighbors with all kinds of horrible consequences. Much of Bishop and Cushing’s evidence about the corrosive effect comes from psycho-sociological experiments like Asch‘s where group pressure causes people to behave immorally (a la Lord of the Flies or the Stanford Prison Experiment), or to censure their own dissonant voice even when they originally believed those views to be correct. [Note: Fiorina has made quite a name for himself on how the political elites in America have become ever more polarized and the masses have over time sorted themselves out more reliably into political parties but the masses views’ have not become any more extreme, so obviously the Big Sort doesn’t square with his other research that uses ongoing surveys like the General Social Survey, the American National Election Studies, etc.] 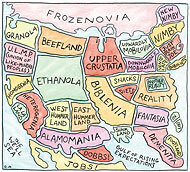 There is a wonderful cartoon that the New York Times did about the Big Sort. While Bishop and Cushing try to look a wide variety of evidence, among them voting records, patent applications, IRS income data, advertisers’ data, etc., Fiorina asserts that the backbone of Bishop’s evidence compares two closely fought presidential elections — 1976 where a moderate Republican Gerald Ford took on a moderate southern Democrat Jimmy Carter vs. 2004 when a Texas born-again Republican George W. Bush took on a liberal northeastern Democrat John Kerry. Bishop observes that there was an increase of 22 percentage points in the number of “landslide” counties from 1976-2004 (defined as a county that went for a candidate by more than a 60/40 margin). Fiorina thinks that this comparison in and of itself is skewed since presidential campaigns are all about personalities and one can’t simply compare one against another and assume that one is witnessing changing behavior of voters. Furthermore, he thinks because of the contestants in those contests, there are many reasons to expect more landslide results by county in 2004 when voters were faced with a starker choice. Nonetheless, he and Sam Abrams have searched for a measure that proxies well for voter preference but measures against a more steady yardstick than votes. They look at partisan political registration by county (which they say predicts voter choice according to other scholarly work). Comparing counties in 1976 and 2004, even if one dramatically lowers the threshold of “landslide” counties to ones where a simple majority of registered residents are one political party (e.g., Republicans), there has been a drop in such counties from 75% of counties in 1976 to 40% in 2004. This doesn’t show sorting at all. For sure, there has been a significant increase over this same time in voters registering as independents, but that itself is an undermining of the “Big Sort” hypothesis, since independents’ vote choice is much more volatile according to Fiorina. Fiorina is doing another project on independents: they are almost never just weak identifiers with a party, but either break with a party over one significant issue or have a much more esoteric alignment of political values. He says that looking at independents over time one sees that there may be as low as 35% of Independent voters from one presidential election to the next consistently saying they are Independent, voting Democratic. Neighborhoods aren’t such an important center, especially in the age of media and blogs and where 2/3 of Americans only know at most 25% of their neighbors’ names. Politics is simply not that important a topic of discussion or way in which we identify ourselves. The three most important ways in which people identify themselves are family (51%), occupation (16%) and religion (10%). Even if you go down to people’s third most important factor, politics only registers 2.7% of people listing that as the third most important factor. Questions: one person asked Fiorina about the Bischoff-Reardon study showing increased income residential segregation over the last generation (at the census tract level); since income itself predicts being Republican, she wondered how those findings are consistent. Fiorina hadn’t seen the study so didn’t want to comment. Fiorina who is working on Americans Elect, believes that the way this could change is for things to get bad enough that a “younger, saner Ross Perot emerges” as a third party candidate (quoting David Brooks). While this is not predictable, Fiorina cited Sid Verba who noted that before the Berlin Wall fell, no one saw this coming, and afterwards everyone could identify the reasons why this was inevitable. He thinks Obama’s most promising re-election strategy is to assert that he’ll be the bulwark against likely control of both houses of Congress by the extremist Tea Party-led Republicans and a bulwark against the political extremism among political elites. Fiorina also commended the recent research by Jim Stimson and Chris Ellis and a forthcoming book that indicates that most liberals truly are liberals whereas white conservatives are a blend of different things. 26% of conservatives are movement conservatives who really do have conservative values (what Ellis/Stimson call “constrained”); 34% are traditional-symbolic conservatives (like Mike Huckabee), many of whom are recruited through churches but don’t necessarily know the conservative party position or have consistent conservative beliefs (what Ellis/Stimson call “moral” conservatives); slightly less than a third are what Fiorina calls “clueless” conservatives (what Ellis/Stimson call “conflicted” conservatives), many of whom are younger, who actually hold liberal positions but think that the conservative label conveys greater respect (like a military official in uniform); and 10% of conservatives are libertarian (just wanting less government in general, whether it is for making marijuana legal and eliminating an army, or doing away with food stamps). Fiorina agrees with the book that when one says that 40% of Americans are “conservative” it is misleading since a far smaller percentage of them uphold conservative positions across the board. 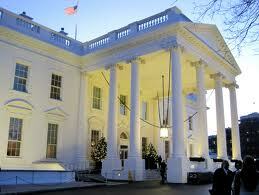 President Obama and Speaker John Boehner agreed to $37.6 billion in cuts for FY11. Details are now leaking out of where those cuts will come from. Apparently while they would largely save AmeriCorps, they would completely defund Learn and Serve America, which is the arm by which the government encourages service learning. Service-learning integrates community service into school curricula so students learn about scientific measurement by measuring the pollution in a local streambed, or learn about the Depression or WWI through oral history projects with shut-in seniors. The projects obviously vary depending on the underlying tie to the curriculum and the age of the students, but service learning is effective for students as young as kindergarten or as old as college-aged. For more information on the cuts and what you can do see YSA’s page. For more information on the benefits of service learning, see the National Service Learning Clearinghouse or this Kellogg Foundation report. President Obama responded to the tragic shooting of 20 on January 8, 2011 including Congresswoman Gabby Giffords in with a wonderful and healing memorial speech in Tucson, calling for a higher level of political discourse. Obama’s passionate voice seems to have returned. The loss of these wonderful people should make every one of us strive to be better in our private lives — to be better friends and neighbors, co-workers and parents. And if, as has been discussed in recent days, their deaths help usher in more civility in our public discourse, let’s remember that it is not because a simple lack of civility caused this tragedy, but rather because only a more civil and honest public discourse can help us face up to our challenges as a nation, in a way that would make them proud. It should be because we want to live up to the example of public servants like John Roll and Gabby Giffords, who knew first and foremost that we are all Americans, and that we can question each other’s ideas without questioning each other’s love of country, and that our task, working together, is to constantly widen the circle of our concern so that we bequeath the American dream to future generations. I believe we can be better. Those who died here, those who saved lives here –they help me believe. We may not be able to stop all evil in the world, but I know that how we treat one another is entirely up to us. I believe that for all our imperfections, we are full of decency and goodness, and that the forces that divide us are not as strong as those that unite us. I want us to live up to her expectations. I want our democracy to be as good as she imagined it. All of us — we should do everything we can to make sure this country lives up to our children’s expectations. We hold Gabby and the other victims of the January 8 shooting in the Light with hopes for strong recoveries (amid recent reports of Gabby’s eye opening and cognitive understanding that showed “raw courage” and “raw strength”). In addition, may Obama’s speech have life beyond the tragedy and start to transform our politics. I hope for our country’s sake that it does, but it involves politicians putting aside point-scoring and running Congress to focus far more on critical problems facing our country (global warming, a decline in educational performance relative to other advanced nations, an investment in jobs of the future, etc.) and focus far less on trying to unseat Obama from the re-election campaign of 2012. One key problem for the democrats in Tuesday’s election was that young voters stayed home. Voters ages 18-29 made up 11% of the voters yesterday (according to exit polls); down almost 40% from the 18% of voters that youth comprised in 2008 and even below the 12 percent of the voters that youth comprised in the last mid-term election in 2006. It is this dropping out of younger voters while the older voters stayed engaged that E.J. Dionne calls “the enthusiasm gap.” Of course, while the concentration of 18-29 year olds among voters is important for what voices are heard in an election, these figures can be misleading — the percent youth comprise of the electorate can fall if there is especially high turnout among other age groups even if youth turnout stays constant. Another way to examine this is youth turnout (what % of eligible voters voted). On this score, the 20.4% of eligible youth who turned out in 2010, was markedly lower than the 52% who voted in 2010. This is probably an unfair test, since turnout is always higher in presidential elections. But even compared with other mid-term elections, the 20.4% was a drop from the 23.5% of eligible 18-29 year-olds that voted in 2006 and a return to levels from 2002 or 1998. Another way of seeing this is that turnout among 18-29 year old citizens in presidential elections went from the high thirties in 2000 to 48% in 2008 (an increase of 10%); over roughly the same time period (including the latest dismal youth turnout numbers), youth turnout dropped a couple of percentage points or stayed flat from 1998 or 2002. How about youth’s very strong preference for democrats? Back in 2008, we were predicting that the youth being overwhelmingly democratic was going to cause the Republicans to be rightly scared for a long time since political loyalties once solidified are much harder to shake. Viewed two years later, it’s clear that many youth haven’t yet solidified their loyalties: youth 18-29 still voted democratic (with exit polls noting 56% of 18-29 year olds voting for House members voting demogratic, as opposed to 40% voting republican). But this 16 percentage point spread toward democrats was much smaller than the 38 percentage point gap toward democrats that 18-29 year-olds exhibited in the 2008 election (where youth preferred Obama over John McCain 68-30 percent); see 2008 map of 18-29 year old preference by state. We reported earlier how the self-identification of young people 18-29 is also trending away from democrats. Despite the lower turnout, young voters generally supported democratic candidates. If one looks at exit polls of votes for Governor in 2010 that had breakouts by age, there were 15 contests (AZ, AR, CA, CT, FL, IL, IA, NV, NH, NY, OH, PA, SC, TX,WI). In 12 of these, the youth vote broke democratic and in 8 of these states, youth supported the demographic candidate by 20 or more percentage points than youth support for the republican candidate. But in summary, these two trends: youth nationwide identifying less as Democrats and youth exercising their rights at the ballot box less are both undermining the attention that politicians pay to youth voters and their issues and helping to shift the electoral map towards Republicans. Obama and Democrats have to hope that they can still recapture some of the youth 2008 enthusiasm both for democrats and voting. And if youth are going to fulfill the civic promise that they showed in 2008, they are going to have to exhibit more consistent political interest and enthusiasm to get their vote heard and make our country strong. Marshall Ganz provided a historical context for OFA. He noted that social change in our history is not a constant, it is episodic: “”Change is slow except when it’s fast. We’re in a fast movement now so let’s not lose it.” This is the first time, Ganz noted, that a social movement gave birth during a political campaign. Successful social movements have to act national but be locally rooted, and to translate national action into local change. Ganz believes that more civic capital has been created through this campaign than ever created through our nation’s history; we have to be creative about using this civic capital. We need to make sure that it is not a one-way arrangement. The theme of OFA members wanting input on policy came up at the OFA-MA event, both in questioning of Mitch Stewart (national director of OFA) and in informal discussions throughout the day. Mitch Stewart noted that OFA’s prime agenda was “to support the President’s agenda.” During Q&A a woman shouted out “We want input in that agenda!” to large applause. Stewart tried to siphon the OFA interest in policy by encouraging people to express their input on whitehouse.gov or by communicating with their members of Congress. He noted that he was not a policy expert and OFA was not a policy organization. But it is clear that the audience wasn’t comfortable with that resolution. Here is a thoughtful post on the OFA-MA meeting by “Bottom Up Change”. OFA-MA has many other resources from the recent meeting including a live-blogging account of the day. Is Global Recession Increasing U.S. Engagement? Typically and historically the effects of a great recession or significant levels of unemployment have been greater civic disengagement. The classic study of the sociological effects of a great recession was in Marienthal by sociologists Jahoda, Lazarsfeld, and Zeisel. They examined the effects of the Great Depression on a tiny Austrian town, 20 m SE of Vienna, in 1931-1932, that captured the psychological costs for individuals exposed to prolonged unemployment, thrown into a vicious cycle of reduced opportunities and reduced aspirations to the point where they didn’t fully pursuing available opportunities. Many workers were unemployed following the closing of town flax mill that affected nearly every Marienthal family; 2 years after closure in 1931, only one in five families had one or more wage earners with regular work and 75% of families were dependent on unemployment insurance. Despite increased free time, people joined less, read library books and newspapers less, the public park fell into disrepair, and the once popular theater club was shuttered. The only organizations that benefited were those providing a direct financial benefit to individuals (e.g., the cycling club which offered insurance to members and the Social Democratic cremation society) The unemployed men in a demonstration of their lower self-esteem and lack of purpose actually slowed down their walking speed and stopped more often. Bob Putnam in Bowling Alone (2000) Figure 8 (p. 54) charted the civic patterns over the last 100 years through the aggregate market share of 32 civic pillars (e.g., the Boy Scouts and Girl Scouts, Rotary, Red Cross, PTAs, etc.). The biggest single rapid decline in the last 100 years was in the Great Depression. A number of groups lost half of their members in 3-4 years in the 1930s. A 2008 study by Brand and Burgard using long-term panel data from the high school graduating class of 1957 in the state of Wisconsin showed that spells of unemployment have a permanent effect in depressing civic engagement. Overview at http://newsroom.ucla.edu/portal/ucla/bowling-alone-because-the-team-55041.aspx . Jennie Brand and Sarah Burgard. “Effects of Job Displacement on Social Participation: Findings over the Life Course of a Cohort of Joiners.” Social Forces. (September 2008). The reasons for this long-term impact are not well-known but may also be psychological. The short answer is that we won’t know until a year or two from now when we have reliable large-scale data, but history is chastening on this score. Obviously in this business, as the mutual funds warn, past performance is not necessarily indicative of future success. But Annie Gowen of the Washington Post examines some tea leaves in “In Recession, Some See Burst of ‘Neighboring’; Tough Times May Be Helping Build Stronger Communities in D.C. Suburbs” (5/4/09) and asserts hopeful early signs. She asserts that due to technology, governmental leadership and an active youth generation, this global recession is currently increasing engagement. My own take is that in all likelihood there is clearly a positive impact of President Obama, who comes from a community organizing background and fully understands the importance of engagement. He ran a campaign that mobilized scores of new voters into the political process and built up an e-mail list of 13 million supporters who expressed their hunger in staying involved. He was a participant in our Saguaro Seminar, and early steps of his administration, like renewal and expansion of the national service legislation, and his volunteering on Martin Luther King day and organizing an effort to help others do so clearly provide a conducive backdrop to those with inclinations to serve. Moreover, Bob Putnam and I have written about the 9-11 Generation, and this will certainly help bolster the country’s civic engagement, aside from the effects of the recession. It could well be that the economy will be having a negative influence on civic engagement, but that some, and maybe all of this may be countervailed by the Obama effect and the 9-11 Generation. – Keith N. Hampton, an asst. prof. at U. Penn.’s Annenberg School, runs i-neighbors.org, a web site for neighborhood groups with 50,000 members. Hampton says that i-neighbors’ communication is up 25% this spring over last spring. Note: Gowen doesn’t mention this in her article but there is clearly strong evidence (more related to the young generation of Americans) about big increases in interest in national service programs, like Teach for America, City Year, etc. This is probably a consequence of 2 intersecting factors, the declining job opportunities for graduating seniors at universities, and a 9-11 Generation (those in H.S. or college at the time of the September 11 attack) that has been more interested in volunteering and politics than the generation that came before.